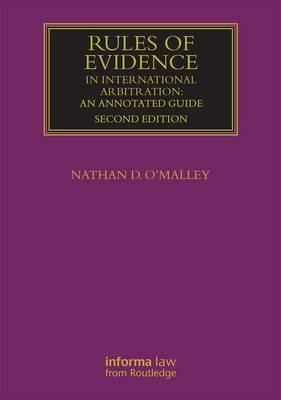 Now in a fully updated second edition, Rules of Evidence in International Arbitration: An Annotated Guide remains an invaluable reference for lawyers, arbitrators and in-house counsel involved in cross-border dispute resolution. Drawing on current case law, this book looks at the common issues brought up by the evidentiary procedure in international arbitration. This book gives essential insight into best practice for practitioners of international arbitration. Readers of this publication will gain a fuller understanding of accepted solutions to difficult procedural issues, as well as the fundamental due process considerations of the use of evidence in international arbitration. Nathan D. O'Malley has acted as counsel or arbitrator in international arbitrations seated throughout Europe, the Middle East, Central and North America, including matters conducted under the auspices of the ICC, NAI, JAMS, WIPO, AAA/ICDR and the Permanent Court of Arbitration, and ad hoc arbitrations. He is currently a partner and chair of the International Arbitration & Litigation Practice Group with the Los Angeles law firm of Musick Peeler & Garrett, previously practice for over a decade in Europe. In addition to private practice, Nathan O'Malley serves as an adjunct professor at the University of Southern California. Nathan O'Malley holds an LL.M. in international trade and business law from Erasmus University of Rotterdam, and a J.D. from the University of the Pacific, McGeorge School of Law.